A badger mum (below) with two cubs close by our “summer” hide,that brings the badger cub total here to 3 so far this year. 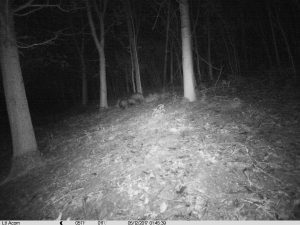 The badger emergence commenced at 8pm last night!! my guess is that the badgers are hungry due to the continued very dry weather that makes earthworms difficult for them to find and the leather jacket pupa are difficult to dig out of the hard ground,!! Below is a pleasing (for me) video of our northern boundary Cete of badgers all above ground together with the only cub I have seen here this year and there is one more adult in the Cete than I was aware of but I have only been watching one of the two sett entrances with my camera! I saw the first Mallard duck chick last week along with one Moorhen chick, so I was delighted to see the content of the video below! !